Upon its introduction, Cadillac's Seville was the brand's most expensive standard model, albeit also their smallest. Today's Nice Price or Crack Pipe '78 shows why size does matter, but will you find that extends to its price? Size was at issue yesterday, as the wee motor in the 1991 BMW 318i convertible we ruminated over, was deemed too small for the too tall price tag that came with the car. Even the siren's song of the E30 couldn't overcome the 58% Crack Pipe loss that car suffered. The old carpenter's maxim is measure twice, cut once, and nobody should heed that more than Cadillac. The modern era is strewn with Caddy's attempts to make a smaller car that would appeal to a less consumptive buyer, as well as those who have had a taste of European luxury. Cimarrons, Cateri, and disproportionately tiny Eldorados, have been missteps in the attempt to capture some of that sales gold, but their first attempt - the Seville - stands in stark contrast, and remains today arguably the best looking Cadillac of the ‘70s. Forged to step the tide of Mercedes and BMW luxo-sedans, the Seville utilized a heavily reworked version of the Chevy Nova's X-platform for its base. Despite those plebeian underpinnings, Cadillac managed to create a car that was Eliza Doolittle in its transformation. The Seville was more than just a super Nova however, it also possessed every piece of luxury accoutrement that Cadillac could throw at it. This '78 Seville was once owned by the seller's grandfather, and you can almost picture the original owner on his death bed, final breath rattling away, telling his progeny's progeny to cherish it always, and let it be my legacy. . . the Seville, the Seville. . . before the great beyond closed its inky curtain on his life. But, even if that were the original owner's final request, this Caddy's now looking for a brand new groove thang. Sporting the vinyl roof (in kind of freaky silver) that all the early cars carried, this Seville remains so good looking to this day that it makes you wonder what the hell happened to GM after it debuted. That padded bra of a top was necessary on the early cars because the roof was made out of two pressings - a unique one in back, and a front part that was shared with the Nova. The wide C-pillar and short-front, long rear overhangs give the car the kind of muscular elegance that was not replicated in ensuing editions. By '78, GM had switched to a one-piece stamping, allowing the upscale Elegante edition to go vinyl-less. The roof is un-pierced by a moonroof - sad if you like those things, good if you don't like the way they inevitably leak. The slab sides are atypical of Caddys of the era, although the amount of chrome trim isn't. Rockers, bumpers, and wheel arches are covered in the shiny stuff, as are the faux wire wheel covers. 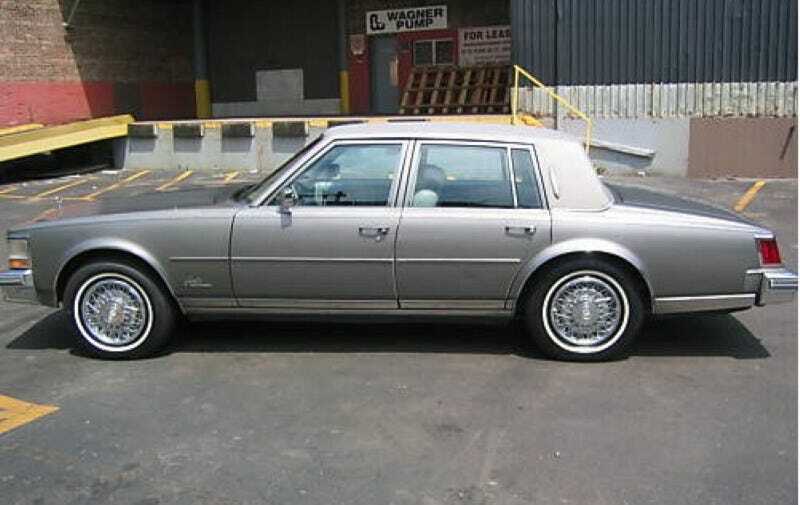 Out back, the graceful slope of the trunk lid ends in a remarkably elegant and subtle rear end with wrap around lights and a simple Cadillac script. Unlike most Sevillians this age, the rubber bumper snoods remain intact, although - at least in the pictures - a little faded. That could also describe the heavily padded and yet oh so flat seats, the leather of which looks to have shined the asses of decades of Sansabelt slacks wearers. The rest of the interior, from the fake wood to the chrome switchgear is like getting hit in the head by a baseball bat from 1978, it's such a jarring departure from the modern ethos of luxury. Speaking of baseball bats, the seller appears to have one sitting in the trunk, so it's probably best not to joke about his grandpa, like I just did. Under its big hood, there beats the heart of an Oldsmobile - of course back in '78, Cadillac didn't tell you that, an omission that got GM in a little hot water at the time. The 350-CID fuel injected motor put out 180-bhp new, probably a few less today, but what it gives up in power, it will more than make up for in leisurely motoring. Part of that is due to the chrome column shifted TH400. Unfortunately, sharing the cabin with that shifter isn't the optional Delco trip computer, which was one of the first to be offered in any car. This Seville has fewer than 70K on its clock, and most of those miles were put on by someone who kept the car for decades, so you can bet they weren't abusive miles. What's one wrong in those miles that the seller is letting onto? Well, the motor for the power antenna has apparently crapped out, so you'll be stuck listening to 8-track tapes. Also, the power trunk lock is on the fritz, so getting to that baseball bat in order to go all Mark Wahlberg on somebody is going to take a key. Other than that, it carries a light patina of age, and does so better than its competitors - the Lincoln Versailles, and Chrysler Rust Bouquet. Of ‘70s luxury cars that you might want to drive these days, the elegant and parallel parkable Seville may reside at or near the top of your list. And at $5,999.99 it's also eminently affordable. But of course we're not here to decide whether someone can buy a car, we're here to weigh in on whether they should. So what do you think, is that penny shy of six grand a price that proves size doesn't matter? Or, does that make you question, if that's movin' up, then I'm movin' out?